As a nation, we are experiencing an under-recognized public health crisis: an epidemic of osteoarthritis (OA). There is an urgent need to elevate OA as a national public health priority. 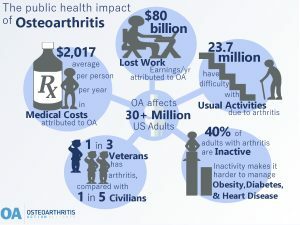 Osteoarthritis is widespread and costly. Many Americans with OA face chronic pain and functional limitations, which often results in job loss and reduced quality of life. OA pain can also inhibit physical activity which interferes with the management of other chronic conditions like diabetes, heart disease, and hypertension. Our country suffers, too. It is dragged down by the social and economic costs of OA. This disease is a common cause of disability, it contributes to escalating health care spending, and it limits national productivity. Unfortunately, OA is met with complacency. Despite the great individual and national costs of OA, little attention is given to this disease. This is due in part to the misconceptions that arthritis causes only “mild aches and pains,” is an inevitable part of aging, and that nothing can be done to prevent or relieve it. Yet in some cases, OA can be prevented and its consequences can be minimized. Evidence shows that injury prevention and weight loss can prevent OA from occurring, and weight loss or maintenance, physical activity, and self-management education can reduce the symptoms and progression of OA. Self-management education workshops can help reduce pain, fatigue, and depression by 10% to 20%. However, only 11% had taken a self-management education workshop.2 Adults with arthritis are more likely to attend a self-management education program when it is recommended by a healthcare provider. Learn more on our Living With osteoarthritis page. OA is a common comorbid condition. More than half of all adults with diabetes or heart disease also have arthritis.1 Nearly one-third of adults with obesity have arthritis. For more on the national burden of osteoarthritis and a list of references head to our page on the Cost of Osteoarthritis.